Find out how your association can thrive in the digital economy from the best in the field. 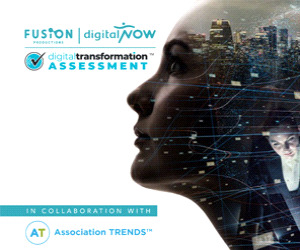 This new report titled “Digital Transformation Assessment for Associations” published by Fusion Productions/digitalNow in collaboration with Association TRENDS is now available for download. The report provides insight and perspective from leading Association Executives and can serve as a roadmap for your organization’s path forward using the Digital Transformation Assessment™ (DTA) tool. Case studies and a continuously updated resource page ensure that the latest material is available. Download the report now to assess your readiness and to lean into the opportunities related to digital transformation. Look for future updates and information related to Digital Transformation in Association Trends and through digitalNow.